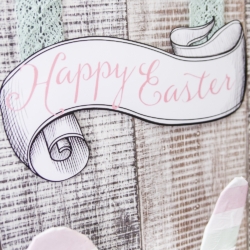 This Easter Bunny sign is easy to make with my free printable. 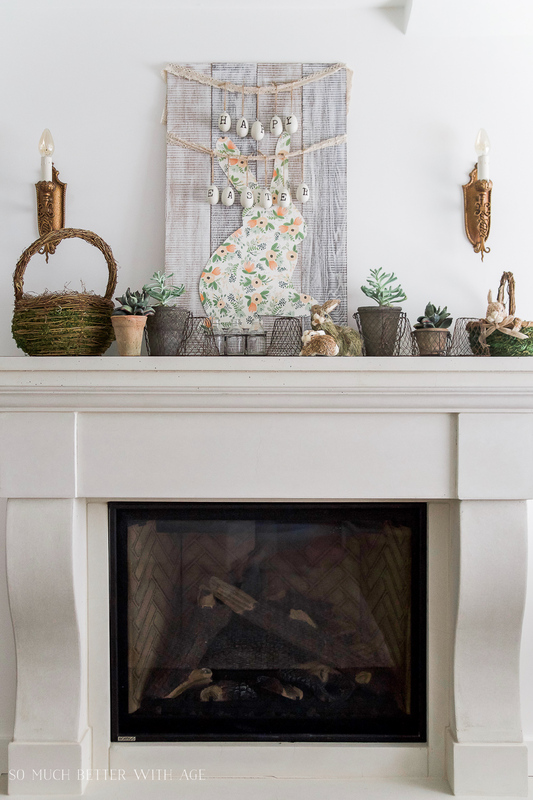 See how I’ve decorated my mantel for spring! 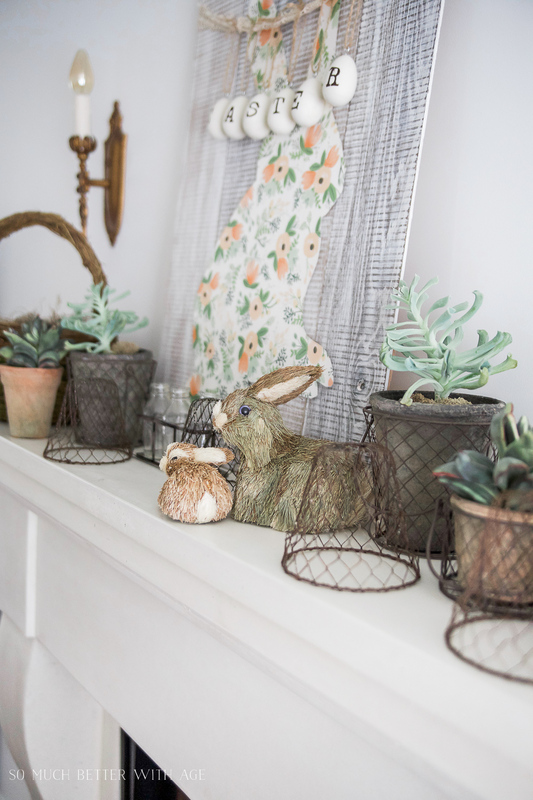 I’ve decorated my mantel for spring with sweet bunnies, succulents and natural elements. 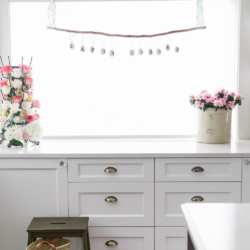 I love adding natural elements and things around my house when decorating with the seasons, especially spring. 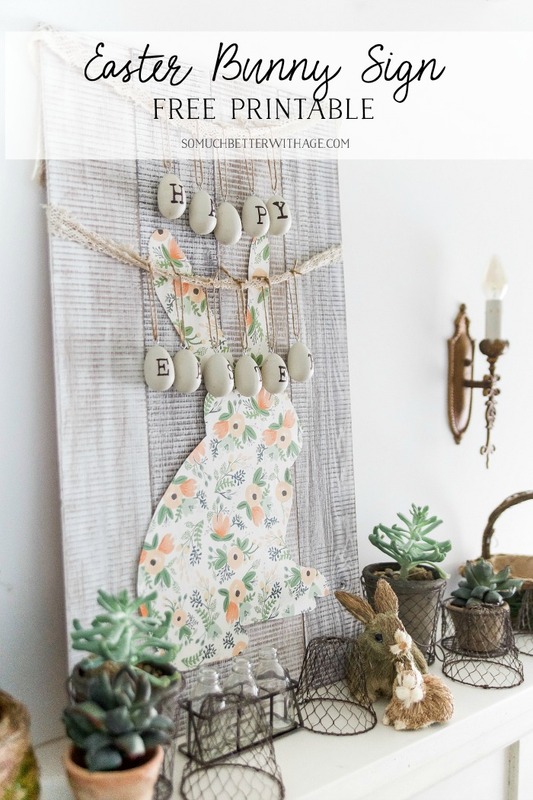 This Easter bunny sign is so easy to make too with my free Easter Bunny printable. Here is what you’ll need to make this adorable Easter Bunny. 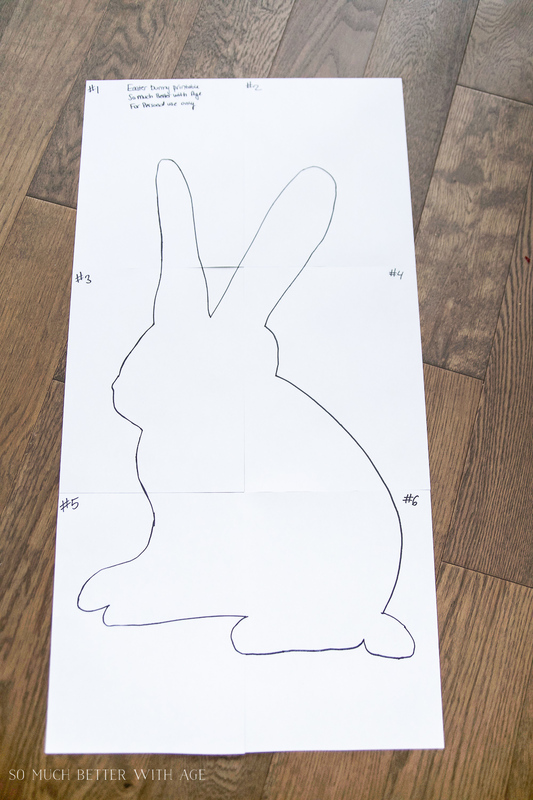 Print out the easter bunny printable/template (subscribe to my newsletter to receive the free printable – instructions towards end of this post). The printable will be printed on to 6 pages that you’ll tape together to create your template. 2. Trace it over poster board and cut out. 3. Place bunny over the wrapping paper and trace it out. Cut out the bunny. 4. 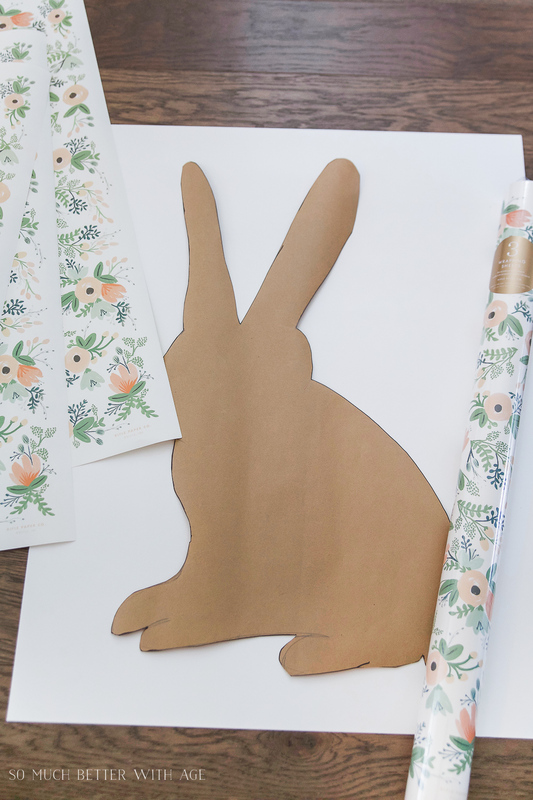 Glue the wrapping paper bunny over the poster board bunny using a glue stick making sure to get all the edges. Press down and smooth out. 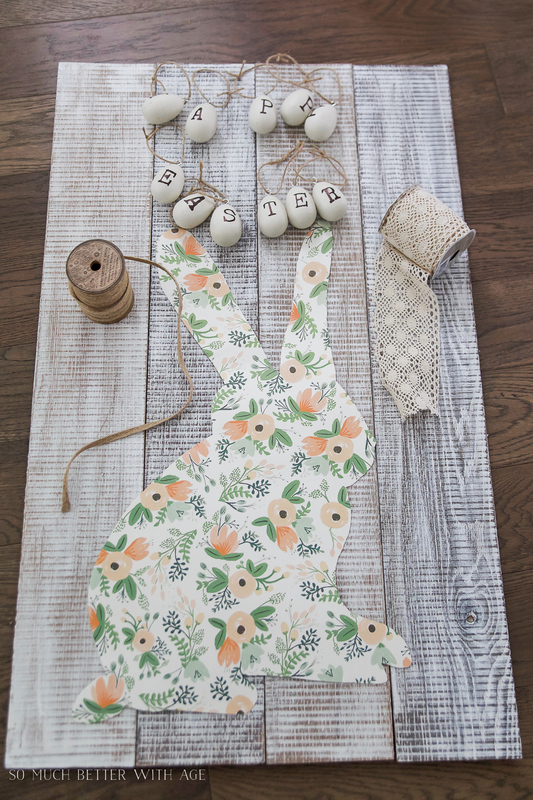 Now this adorable easter bunny is ready to be placed on the pallet sign or hung anywhere else. 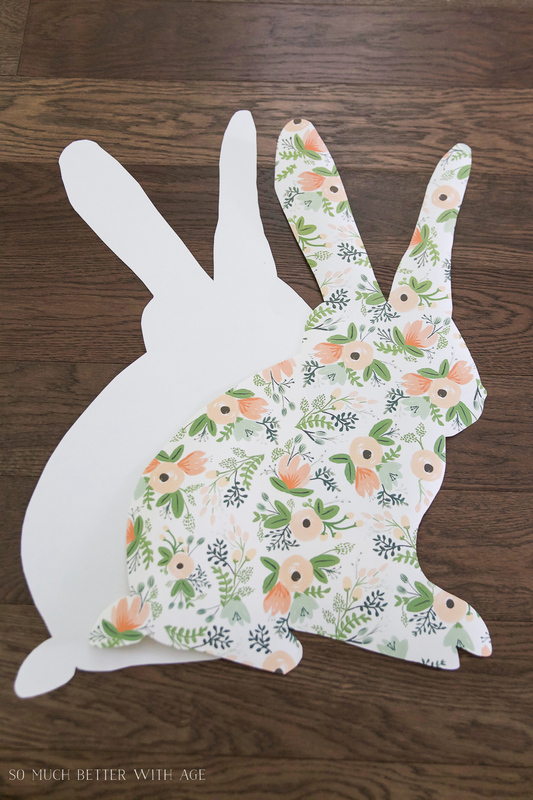 Use double-sided tape on the back of the bunny. 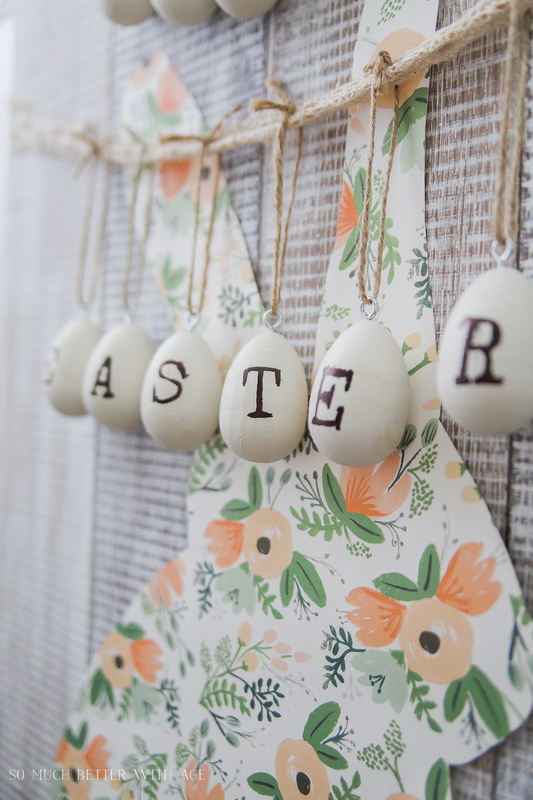 I used the vintage Happy Easter eggs that I recently made and hung them on the sign using some eyelet ribbon to make a garland. I think it’s adorable! And the eggs and ribbon give the whole sign such texture. The eyelet ribbon that holds ‘Happy’ is just held up by the hole in the ribbon on each corner. I tied the back of the ribbon together with some twine for a firm hold for the ‘Easter’ eggs. 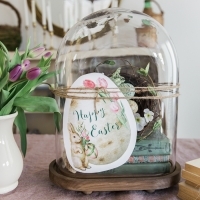 It’s another way to use those Vintage Easter Eggs I love so much! Here is the sign along with my mantel decorated for spring. I used succulents, baskets and wire pots to bring in natural elements and textures. 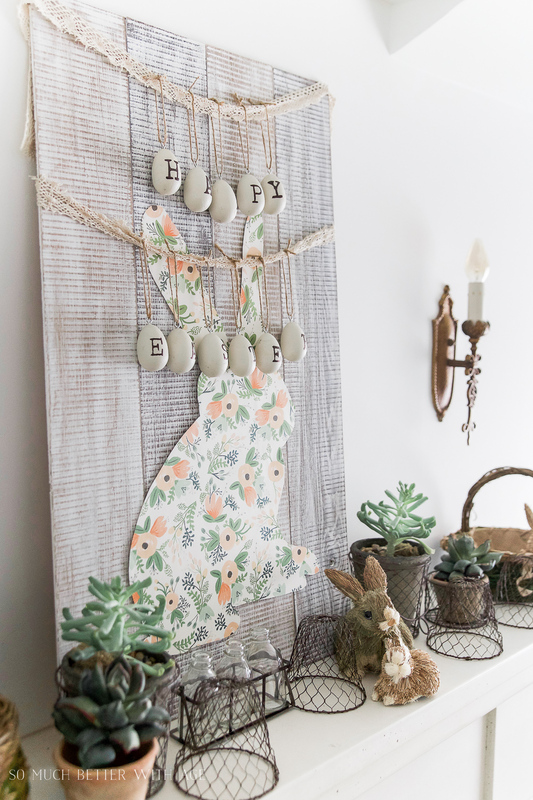 I hope you have fun making your own Easter Bunny sign this year and I hope I’ve inspired you with some spring mantel decor. 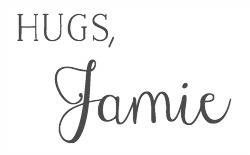 To download this printable, subscribe to my newsletter. Your sign is real cute,thanks for all the information. 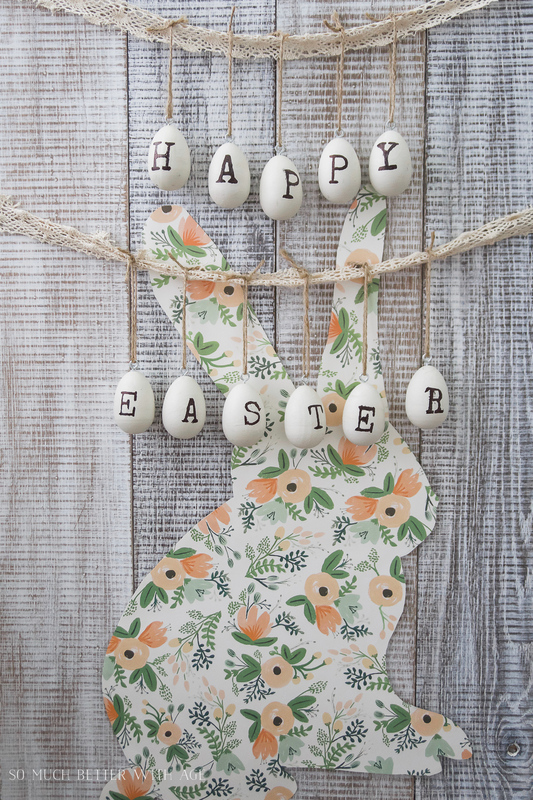 Love the bunny and Happy Easter – so cheerful. Lots of good information. I like the re-do, esp. because of there being no problem with bubbling, and the Easter eggs garlands. But the first idea is cute in its own right, too! Thanks for sharing both ~ so we can choose our favorite! Thanks Kathleen! Yes, I agree this way is better without the bubbling. 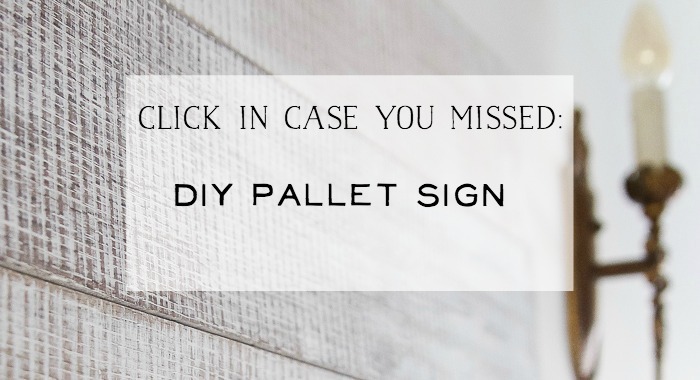 Love your sign and the eggs…… they have my creative juices going Thanks for the inspiration …..
OMG, I love it all. So beautiful and creative. 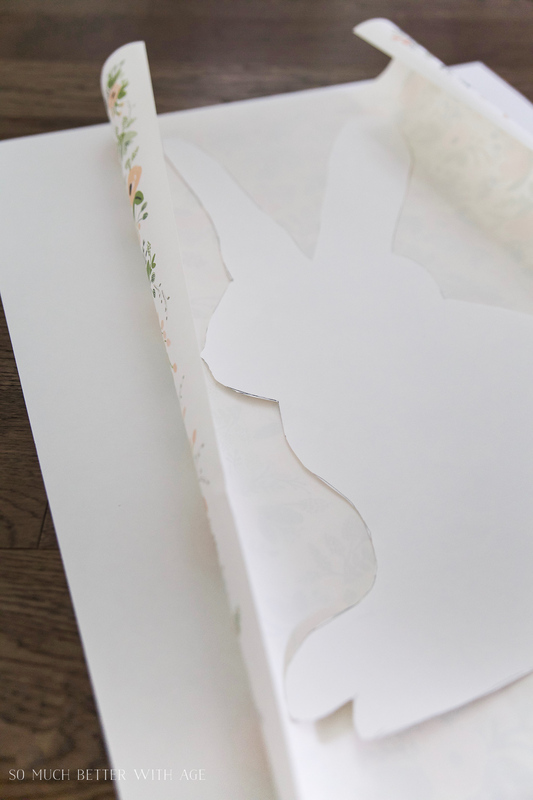 This is soo pretty I love the paper idea for the rabbit! Pinned & sharing! Thank you for sharing on Merry Monday! Hope to see ya next week! I love your sign! Pinned it. 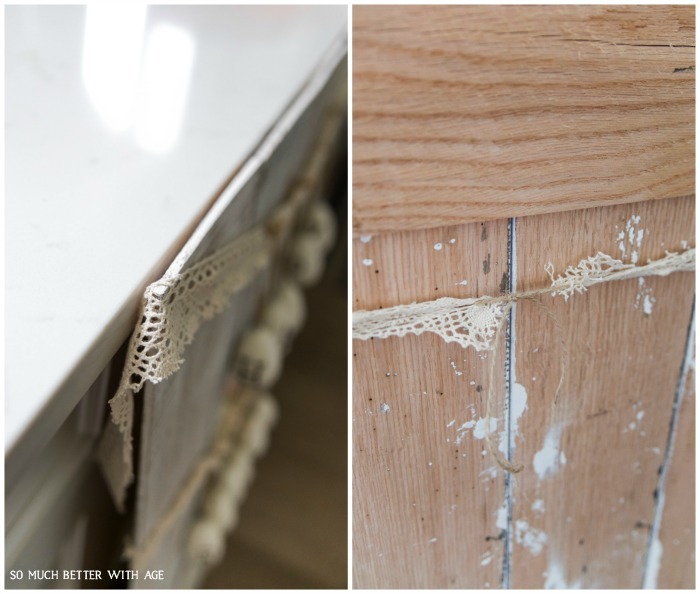 I love the paper and this quick and easy way to update your mantel. Will be featuring this in this week’s MM roundup. Pinned. Thank you so much, Erlene! Have a great week! Your sign is really really pretty. I love how it is designed. Pinning. 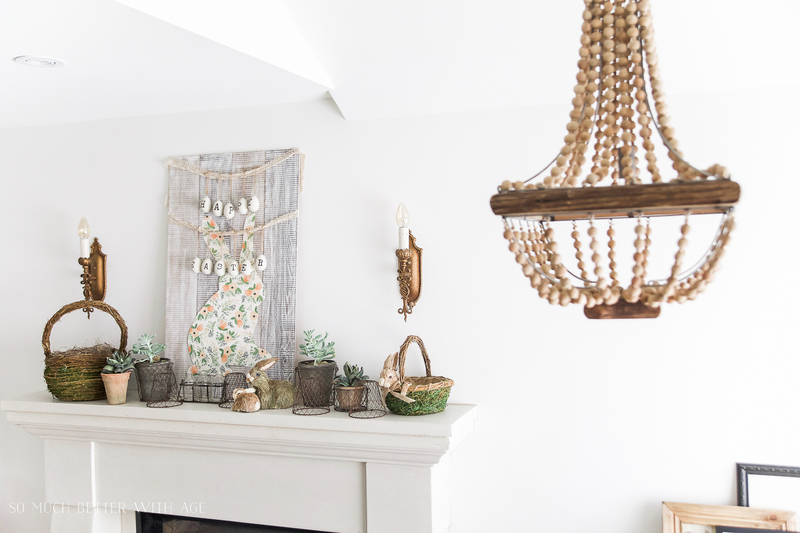 Such a lovely mantle, Jamie! That paper you used is adorable! 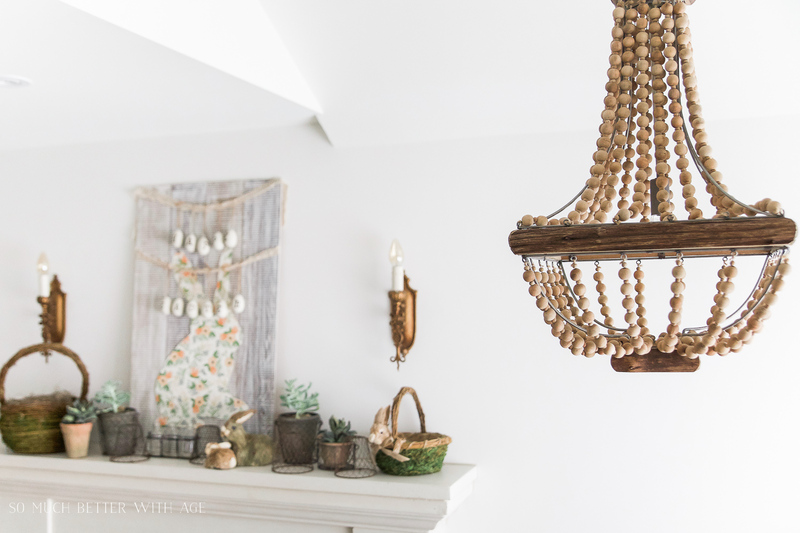 Would love to have you link-up at Homestyle Gathering! Thanks so much, Julie! It was so fun to create. What day is your link party? 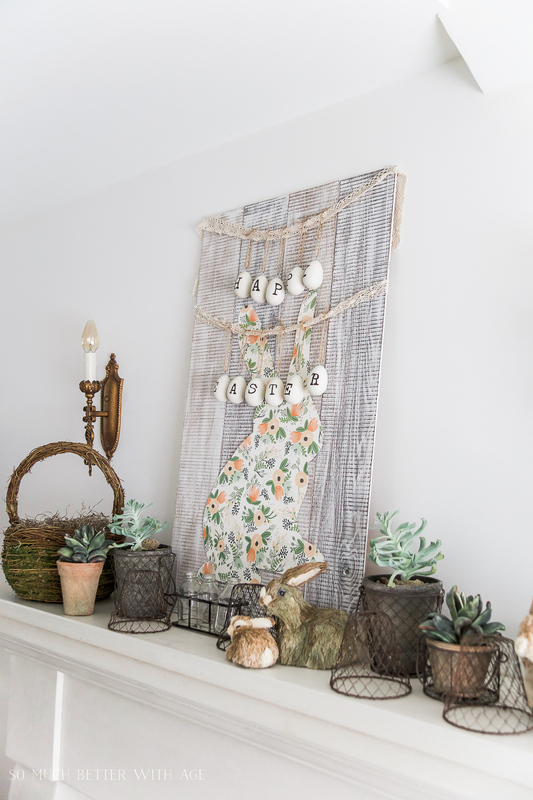 Your spring mantel looks so lovely Jamie and that bunny is adorable!! Thank you for sharing this project at Create, Bake, Grow & Gather this week. I’m delighted to be featuring it at my party tomorrow night and pinning too. Thanks so much, Kerryanne! I love your parties! Your Easter sign is ADORABLE! Love the pretty floral wrapping paper you used. 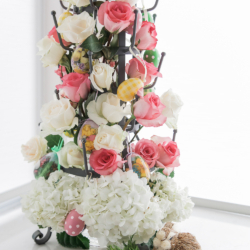 The stamped egg garland is the icing on the cake. Pinned 🙂 Thank you for sharing at the Talk Of The Town party! Still lovin this mantle! Thank you for sharing on Merry Monday! We hope you will join us again next week!